its a good phone but im not so interested in it because the n8 had a 12mp camera and the n9 with a 8mp camera. also the downloading speed is also redused from 21mbps to 14mbps. Ced, 19 Jun 2011I know this is worth the wait. :) I wish N9 will be dual-core and with a Gig or even 3/4 GB of... moreits having a 1GB ram. How can the music playback time be 50h when on an ipod Touch 4g does not exceed 40h? did i miss something here? 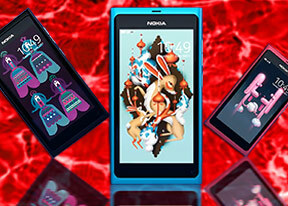 PROS - Good work on viewty of Nokia smartphone.MEEGO OS.8MP is today's need.1Ghz Cortex processor. Slimmer than N8. CONS - Not having FM Transmitter. CONCLUSION - If prices around 25k its worth buying. AnonD-11536, 21 Jun 2011the racing days of nokia are over now, OS can't compete with the rivals, the compatibility o... moreI found this in another forum which was picked up, so early days yet. You may need read it again because it is HUGE! You know where the asteroid is on a collision course with earth, THIS ASTEROID IS BIGGER THAN THE EARTH! it's lack 12MP,doul core processer,1080p video recording,21MBPS 3G,and Radio. This phone is worth the wait for us Nokia die-hards. Other people can criticise Nokia but now I can say Nokia has woken up. Please release this phone as fast as possible. We are eagerly waiting. In today's world. Why buy a smartphone which does not have iOS or Android. It is a waste. What's the point? MeeGo is going out the window, replaced by Windows Phone soon.. Not worth it. Phone looks nice, but might as well wait. Nothing to say about N9. N95 still the best. A-GPS is not a solution in Brazil. Zhane, 21 Jun 2011this will only ship at the end of the quarter or maybe next year to not disturb the production... moreNo. That is just what u think. N9 might release in a month times. And nokia promise to have at least 15 phones release this year. And how many had u seen? This phone has the potential to disrupt the mobile world. But that can be fulfilled only when there are sufficient apps to work with. Nokia, pls ensure that all android apps work with this device and you have it made. Tie up with Dalvik and get the 100000+ android apps running seamlessly and i will purchase not one but two of these.